Discussion in 'Edged Tools' started by leightyj2, Aug 26, 2018. Thought it would be fun to post this. I know IAwoodsman did a bunch of videos on this tool which made me want one. Had it for a few years and only used it for digging in the garden and to leave in my trunk. 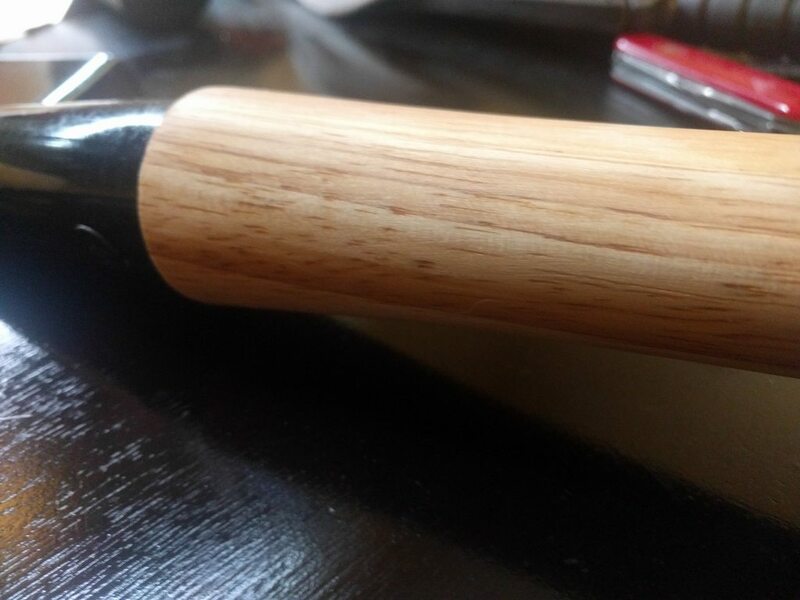 Recently decided to throw a jute wrap on it with epoxy, took off the shiny finish and sharpened the sides with files then sandpaper. Since then I really have been impressed with its performance as a woods tool. Just throw it into a stump and make draw curls very easily with the sharpened edge. Cool thing is after you make a big shaving pile you can start your fire on the shovel and then transfer the whole thing to the fire on top of the shovel. Would love to see some others post photos of them using their military style shovels for different bushcrafty things! Mattexian, blind & lost, Staleym and 32 others like this. It's funny you should start this thread now, because I JUST got the first dirt on my shovel digging this thing up from under my porch. Mattexian, blind & lost, ExAF1N1 and 28 others like this. Wow you are braver than I digging that up! Staleym, MrFixIt, Beach Hiker and 8 others like this. Since they call it a "Russian special forces" shovel, I figured it would take something brave and crazy to properly christen it. Mattexian, blind & lost, Staleym and 16 others like this. @Fowler ? @Bad Little Falls ? MrFixIt, Not Sure, ANFwoodsman and 3 others like this. So, at Puckerbrush this past July, Fowler made it to the event, so I ventured near his booth and tossed out the idea of using the shovel as a bearing block for friction fire, I hadn't really tried it but knew it had potential. Later Zack stopped by the friction fire booth and we gave it a go. Here is Fowler's video I will tag it where the shovel and friction fire start off but the whole video is worth a view. Mattexian, JGB, Medicine maker and 14 others like this. DixiePreparedness, blind & lost, actichy and 16 others like this. Mattexian, IAOutdoors, blind & lost and 17 others like this. JGB, MrFixIt, Beach Hiker and 3 others like this. My shovel actually gets the most use when I'm fishing from the beach. It works great to pound in rod holders, dig fire pits in the sand, and it's excellent at chopping frozen bait. My shovel has also been used to dispatch more fish and game then I would like to admit. It's such an awesome tool! Mattexian, actichy, Medicine maker and 8 others like this. I used mine to kill a rat the other day. Not sure how it got in the house but the best theory is that the cat brought it in. She has a history of bringing in live birds to play with that we then have to chase around with a net lol. Pretty gross. Mattexian, Madwell, Glock Holiday and 7 others like this. Guess I have to get one now. Been holding off as long as I could. actichy, ANFwoodsman, MrFixIt and 6 others like this. Mattexian, ExAF1N1, actichy and 10 others like this. Gentlemen, start your shovels...let the carnage begin! Medicine maker, Madwell, MrFixIt and 3 others like this. Better than an E tool. No moving parts to break. Mattexian, Medicine maker, sea6ear and 7 others like this. SGM F use to say when someone just wouldn't listen and he was at the end of his patience, "am I gonna haft to get my e-tool? MrFixIt, Beach Hiker, Not Sure and 2 others like this. Worse than an e-tool, poorer leverage and takes up more room if leverage increased. We can dance this dance all day long, but my e-tool is only 75yrs old and still going strong, so, what do I know? It could let loose at any second, right? Meanwhile, all I did was mention I had an e-tool and would find the desired Cold Steel superfluous, zero attempt to hijack thread to a which-is-better subject changer, and really ought to be left at that. Medicine maker, Glock Holiday and chndlr04 like this. Mattexian, blind & lost, TomJ and 12 others like this. I use mine for fun . It's a very capable tool so don't be midled by the fun remark . But who'd of thought a shovel could be fun ? Glock Holiday, MrFixIt, savage99nc and 1 other person like this. My CS Spetz has been hanging in for about 20 years, it's been a machete, spatula, boat paddle....I did have some fun photos on an older computer but it crashed to beyond retrieval or resurrection. . It a good tool that I would replace if something were to happen to it. actichy, MrFixIt, 45jack and 2 others like this. First mission fer my shovel.. gathering some sasafras roots. Gonna make me some tea! Mattexian, actichy, Glock Holiday and 5 others like this. Was the friction fire successful? And did you try the shovel or use the knife for the bearing block? Oakenhart, MrFixIt and Not Sure like this. leightyj2, Madwell, ANFwoodsman and 3 others like this. ground down to fit the Shovel/Handle Joint. Also, second link I posted has more info on it. actichy, Madwell, Oakenhart and 3 others like this. Oh, I see, you used the seam where the socket meets the handle. I hadn't thought of that end. With Fowler in the above video I posted I used the channel in the blade of the shovel, on the under side right at the end of the shovel handle. It was tricky keeping the spindle in place but no friction to speak of. actichy, Oakenhart, MrFixIt and 1 other person like this. I just ordered the Cold Steel Special Forces (CSSF) Shovel, should arrive Thursday. Don't have any 'in-use' images, yet. LOL! I currently own a Glock E-Tool. I've had it for a couple of decades. I love the Saw in the handle! While I find it adequate for most of the tasks I've asked of it, the friction locking mechanism is a little 'fiddly' and loosens with use. I find myself having to tighten it while performing moderate to heavy tasks. It's never failed, so I can't really complain. Made of Glock polymer, except for the Blade and some hardware, it shows little, or no wear and tear. I have plans for both of these E-Tools. The CSSF Shovel has a very good reputation amongst the Cognoscente and it recently got a little 'Air-Time' on "Alone" with one of the contestants. It's been one of those things on my 'list', if I find a good price. I did, just that. I thought about getting a vintage Soviet era MPL-50 entrenching tool, but quite frankly, being an 'old Cold Warrier', it irks me to own anything Warsaw Pact. But, that's just me. Besides, from all accounts the CSSF Shovel is arguably as good and , maybe better than the Soviet version. If, the Heat-Treat and Temper stories I've heard are correct. The best 'feature' is it's cheaper. I'll report back on my initial opinion of my new CSSF Shovel when it arrives. actichy, MrFixIt, Bushcraft-kelso and 2 others like this. While at the bushbox I spotted a small poplar stump just behind it. Well it had to go. I could see myself tripping over this in the dark and running my cheek down the edge of the tin and having two mouths.. cut me? I think not!! most was rotted but the center was still solid but the shovel worked like a champ! And even after shoveling and chopping rocks and dirt held a surprising edge! I got a pine tree that's next. Mattexian, Staleym, actichy and 7 others like this. Had a dead tree in the path to the bushbox.. this was a good test for my new shovel said I.. I wasn't about to leave a stump tho... so I got to chopping.. and digging.. and chopped.. and chopped and dug grabbed a hand full of Muscadine vines and gave it a tug, all it took giving the leverage I had with the other 30' of tree and the vine. much better and an excellent test on my lil shovel. Very impressed with this guy. Held a good edge considering all the dirt and slate I went through to get this done. Anywho fun stuff! blind & lost, Staleym, actichy and 11 others like this. Standing guard before the fire. Mattexian, TomJ, blind & lost and 17 others like this. sea6ear, savage99nc and MrFixIt like this. @leightyj2 I felt bad about hi-jacking the thread, so I deleted my posts and started a new thread. My apologies to the OP. I've told this story before, but around 30 years back, I was driving through a residential area through a snow storm, on my way to work. High centered my 2WD compact pickup on a snow drift out in the street. Mazda B series-remember 14" tires? Discovered a Missouri front license plate was a lousy substitute for a shovel. Dead certain it still is. Got to work 45+ minutes late (I'm NEVER late), and had an unpleasant conversation with my boss. Bought an Ames garden shovel that weekend, and threw it behind my seat. Cold Steel isn't the best, but it's good, consistent, and readily available. To me it's the best thing they make, or ever have. Mattexian, Staleym, actichy and 2 others like this. I've thought about getting one, but I doubt I would ever actually carry it into the woods with me. My buddy has one and LOVES it. With his CS shovel and a CS Bushman on the end of his walking stick, he's ready for anything. Mattexian, Staleym, Madwell and 2 others like this. Took my CS shovel along for the GABC trip! Staleym, Madwell, hdbeav and 5 others like this. Mattexian, blind & lost, Staleym and 15 others like this. Mattexian, blind & lost, Staleym and 4 others like this. @tobiism , that's hands down the best looking CR shovel I've ever seen. Staleym, ExAF1N1, Madwell and 3 others like this. Staleym, Madwell and MrFixIt like this. Needed to get this deer out of the woods and have been meaning to mess around with making a travois. Out comes the shovel and some cheap rope from behind the seat of my truck. Chopped down a couple saplings and got to work. There was a fair amount of trial and error, and some things I would do differently on the next one, but the bottom line was- it functioned! ANFwoodsman, Mattexian, blind & lost and 13 others like this. That's it, I'm buying one. Staleym, Madwell, MrFixIt and 1 other person like this. ANFwoodsman, blind & lost, Staleym and 8 others like this. Well little tootie tripped over this root today down at the bushbox.. had to go. Processed some maple, worked better than I expected! Shovel feather stick!! 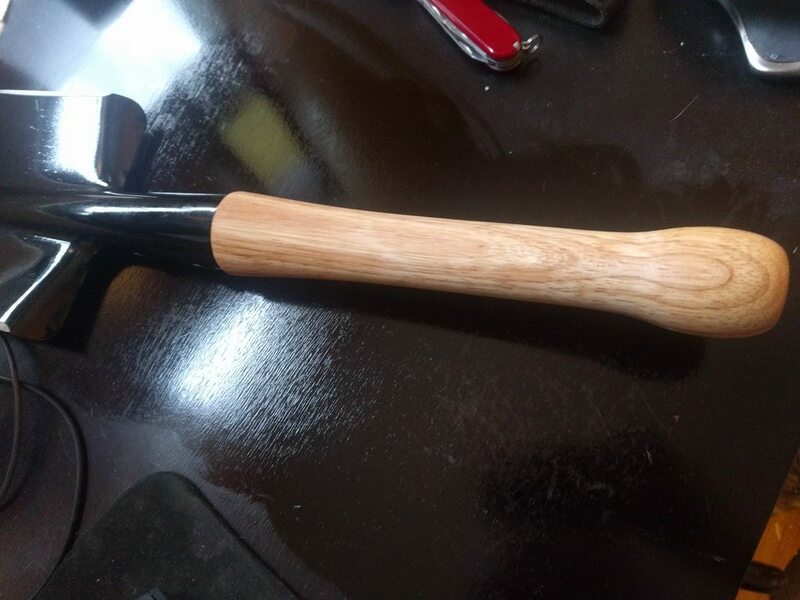 Fun and functional tool. Mattexian, blind & lost, Staleym and 7 others like this. True to my word, I bought one of these shovels. I really like it. While I haven't gotten a chance to use it yet, I did want to show something off. While I was removing the stickers I noticed that the label on my Goo Gone makes no mention of anything but oils, so I thought hey - why not try treating this handle with that instead of the usual BLO? I sanded it down and have now applied two coats of the stuff, and I think it looks and feels very nice. 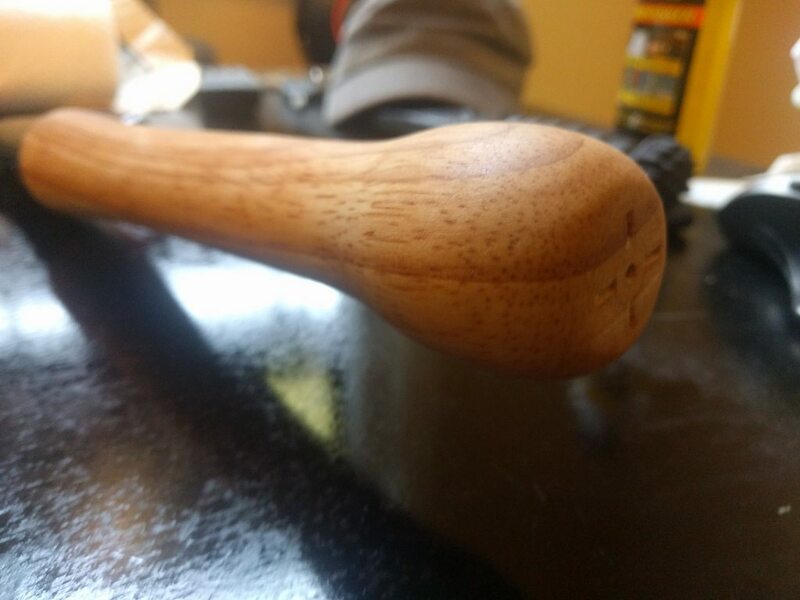 We'll see if it dries out on me, but it did really bring the grain out of the handle beautifully. blind & lost, Staleym, WILLIAM.M and 4 others like this. Nice! 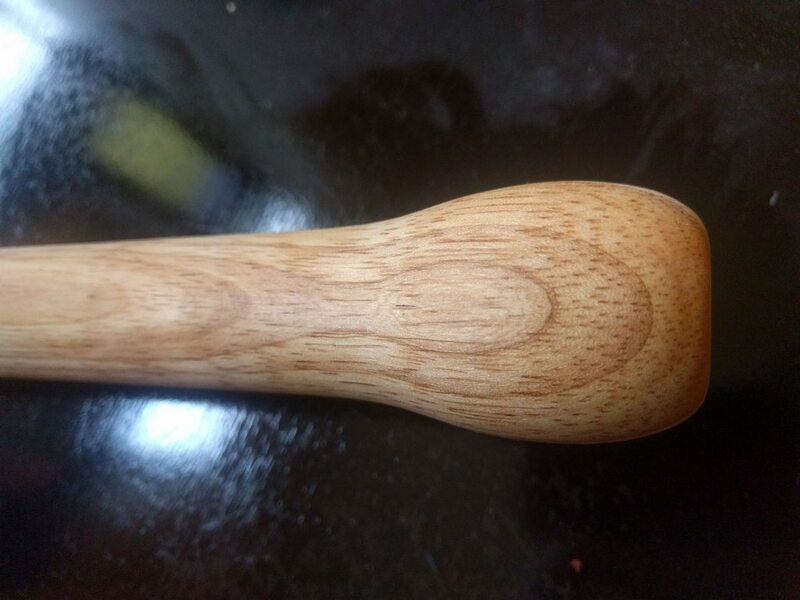 One thing I did that I felt made it feel much more comfortable to use is I got rid of the lip on the wood handle where it meets the steel socket. Now it's a smooth Junction between the two. Will be interesting to see how the Goo Gone holds up! I think Goo Gone contains citrus oils so it should work fine. Staleym, MrFixIt and Madwell like this. Ferro rod striker.. I been playing dumb lately starting fires, prep wise. Seeing how they turn out. Staleym, schapm and MrFixIt like this. Hey there. There is a reason that Cold Steel calls this the Spetznaz (Special Forces) Shovel. Below is the Introduction to the book. It details many uses of this remarkable tool. Every infantryman in the Soviet Army carries with him a small spade. earth that has been dug out protects the soldier from bullets and fragments. hours the unit has a trench linking all the riflemen's trenches together. the order to halt, he again builds his impregnable fortress around himself. measurements in mind the soldier can measure anything he wishes. not to reflect the strong sunlight. I have just uploaded a full copy of the text in the Downloads/History section of the forum. Strongly recommended for ex mil and interested. Not so much for trad/reinactor folk. Mattexian, Sandcut, blind & lost and 1 other person like this.